During Shakespeare’s lifetime Birmingham was a town of a similar size to Stratford. But while Birmingham grew into a great centre of industry and innovation, Stratford remained a small country town. By 1851 nearly a quarter of a million people lived in Birmingham, just twenty miles away. The town had a high reputation for engineering, but it was also “the workshop of the world”, where quality metal items such as buttons, medals and jewellery were manufactured. Back in 1769 a bronze medal had been struck by Westwood of Birmingham to celebrate the Garrick Jubilee in Stratford. In 1816 when the first celebration was held on Shakespeare’s birthday, a handsome bill proclaimed that “A beautiful medal… manufactured by Otley & Dowler of Birmingham, representing the Immortal Shakespeare was available in Stratford from Mr Ward. ” There were other links with Birmingham in the same year: the actor Mr Elliston offered the Stratford Corporation the services of his professional actors: “I shall have at that period a very respectable company at Birmingham”. Mr Bell Wheler replied “I am sorry that the Mayor and other Magistrates will object to theatrical performances at this time”. The implied reason for the rebuff is that the visit would not be financially viable, but was this old-fashioned Stratford’s stuffiness against go-ahead Birmingham’s enthusiasm? 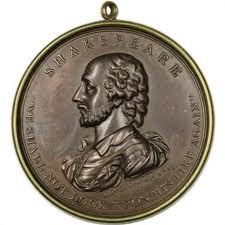 Birmingham continued to supply medals to commemorate Shakespeare’s birthday celebrations, and several examples are shown on the Windows on Warwickshire website. Gentlemen from Birmingham were members of the Shakespearean Club, and took part in the annual celebrations held in Stratford. In 1830 fireworks were provided by Mr Ashley of Birmingham. By 1847, Stratford’s focus had shifted towards London. The purchase of Shakespeare’s Birthplace for the nation had been organised by committees in both Stratford and London, and the traditional dinners at Shakespeare’s Hall (the Town Hall) were taken over by high-profile guests from the metropolis. Locals, including tradesmen, were pushed back to the traditional home of the Shakespearean Club, the Falcon. One report commented ruefully that this included people from Birmingham who had attended the dinners for over twenty years. The two dinners continued to be held as pretty well the only celebration of Shakespeare’s Birthday until at least 1852. Things changed in April 1853. 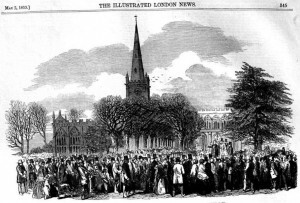 The Illustrated London News reported “This year…a number of Birmingham gentlemen made arrangements for a “pilgrimage”… to be followed by two concerts, a series of orations, and a dinner in the evening. Unfortunately…they did not think proper to consult the influential residents of Stratford-on-Avon and its neighbourhood” The result was two separate celebrations. There was a dinner on the 23rd as usual, and the Birmingham contingent fixed on the 26th. “The weather was bright and smiling, but not so the Stratford people, who held aloof from the celebrations”. Omnibuses arrived at 11, and the Birmingham party set off from the One Elm to the Birthplace at 12. They entered the house, and Mr George Linnaeus Banks ascended a temporary platform in front of the house to deliver an oration “properly rebuking the apathy of the townspeople”. The procession continued to Holy Trinity Church “where the ‘sordid spirit’ was fully exhibited in the form of a placard, in large letters, stating that a gratuity would be expected for the clerk “. 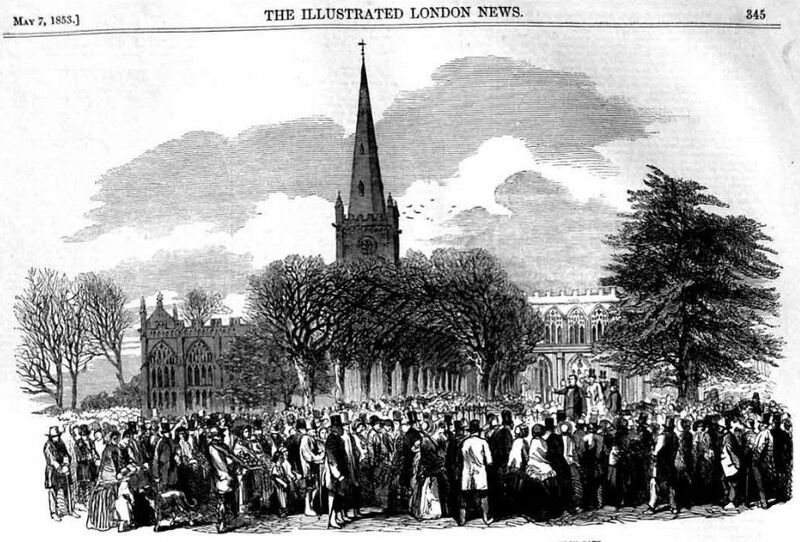 Outside the church Mr James Bennett, tragedian of the Theatre Royal, Birmingham, delivered an ode, as shown in the illustration. A concert, orations and a public dinner followed before they all got back in their omnibuses and departed. The gleeful report in the national Illustrated London News, must have been humiliating to say the least for Stratfordians. Looking back, it now seems a pity that it was not possible for the burghers of Stratford to work alongside the energetic and wealthy Brummies, who seem to have decided to go their own way. In 1856 three inns in Birmingham held dinners to celebrate Shakespeare’s Birthday: The Red House, The White Horse, and the King’s Head. And Birmingham was soon to prove that it could celebrate the life and achievements of Shakespeare in a style that Stratford couldn’t match. Mr Samuel Timmins, who was also on the Committee for Shakespeare’s Birthplace, first proposed the creation of a Shakespeare Memorial Library in Birmingham in 1858. 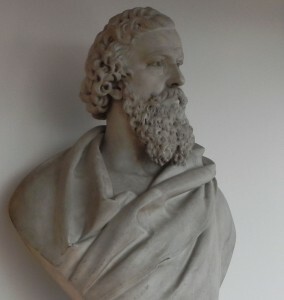 In 1861 liberal reformer and preacher George Dawson publicly floated the idea: “I want to see founded in Birmingham a Shakespeare Library which should contain (as far as practicable) every edition and every translation of Shakespeare; all the commentators, good, bad and indifferent; in short, every book connected with the life or works of our great poet. I would add portraits of Shakespeare, and all the pictures etc., illustrative of his works”. A committee was formed in 1863 and the Library was officially founded in 1864 on the tercentenary of Shakespeare’s birth. It opened, as part of the Birmingham Reference Library, in 1868. Dawson’s address at the opening of the Reference Library indicates the importance of learning and culture to those who governed Birmingham: “a great town is a solemn organism through which should flow, and in which should be shaped, all the highest, loftiest, and truest ends of man’s intellectual and moral nature…; we have made provision for our people – for all our people”. Birmingham was keen to be seen not just as a centre of industry, and its civic pride manifested itself in enthusiasm for Shakespeare, a Warwickshire man. Was Stratford piqued by the competition, or was the development of the Shakespeare celebrations and the founding of a theatre, art gallery and library down to the opportunities brought by the railway that linked the town to Birmingham from 1860? This entry was posted in Legacy, Stratford-upon-Avon and tagged Birmingham, George Dawson, Library of Birmingham, Samuel Timmins, Shakespeare Birthday Celebrations, Shakespeare Club, Shakespeare's Birthplace. Bookmark the permalink.